Smoke and arrows are back as the Hunter third subclass in Destiny 2. The Nightstalker Hunter will be the third subclass in Destiny 2. Like the other third subclasses, the Nightstalker quest will drop randomly. Smoke is back as a melee, but there are significant changes this time around in Destiny 2. Since Shadestep, the main Nightstalker ability, is know the Hunter Class Ability, the third subclass has some new perks that are sure to excite you this time around in Destiny 2. The Nightstalker Shadowshot was the first Hunter super to be loved in PvE, and it should serve the same function again in Destiny 2. 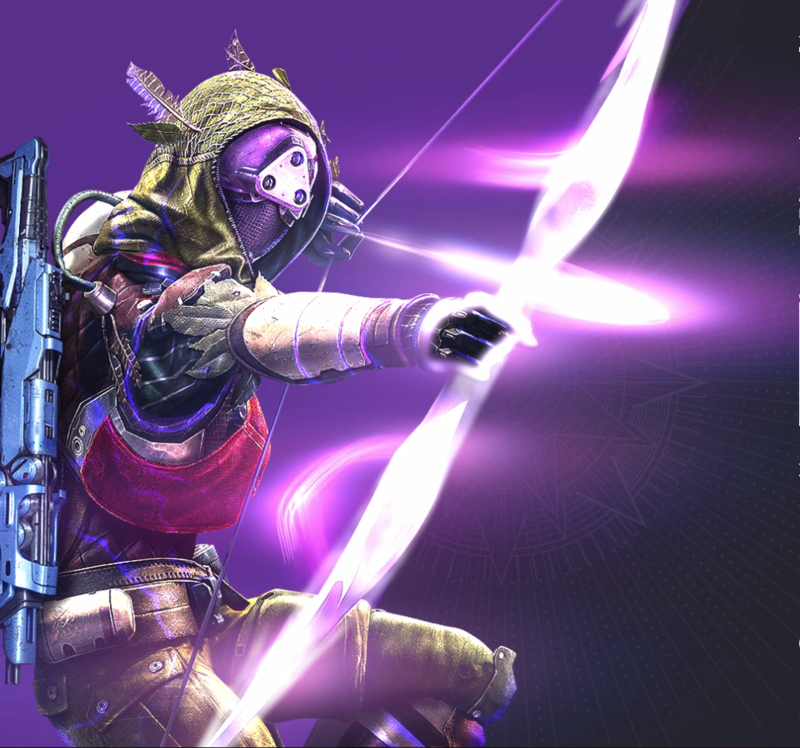 The Nightstalker will pull out a Void bow, creating traps or dealing damage to enemies. Those caught in the trap will lose their abilities, take more damage and get a slower movement speed. Vortex Grenade - Creates a vortex that continually damages enemies trapped inside. Spike Grenade - The Spike grenade sticks to a surface and provides a cone of void damage. Voidwall Grenade - The void wall grenade creates a burning wall of light. The Nightstalker third subclass has three string grenade options, but unfortantely they all amount to zone control and not flat out damage. In the original Destiny, the Voidwall will create a wall that is perpendicular to its flight path, if it hits the ground directly, or the wall will be random if it bounces off an object before hitting the ground. This is most likely the case again in Destiny 2, but more testing is required to know for sure. Similar to the Nightstalker Shadestep, all Hunter subclasses can now Dodge. Gambler's Dodge - Dodging near an enemy recharges your melee ability. Marksman's Dodge - Dodging will automatically reload your weapon. High Jump - Increased height. Strafe Jump - More directional control. Triple Jump - Gain an additional jump. The Hunter jump options are very fast and great for PvP mobility. As we mentioned earlier, the biggest change to the Nightstalker third subclass in Destiny 2 is the Dodge. Since the Dodge is no longer special to a Nightstalker Hunter, they have a few new tricks up their sleeve in Destiny 2. Snare Bomb - Your Smoke melee will stick to surfaces and detonate when enemies are near. Keen Scout - Sneak faster and gain an enhanced tracker. Deadfall - Void bows fired from Shadowshot will become traps on the ground. Anchors have increased range and last longer. Vanishing Step - Dodging makes you invisible for a short time. Vanish in Smoke - You and nearb allies in a Smoke will be invisible. Lockdown - Grenade and Smoke last twice as long. Heart of the Pack - Killing tethered enemies creates orbs, and buffs nearby allies with mobility and recovery. Moebius Quiver - Shadowshot can be fired rapidly, enemies hit by an arrow while already tethered will take bonus damage. Unfortunately for PvP players, Bungie has split up Keen Scout and Lockdown for the Nightstalker third subclass in Destiny 2. Way of the Trapper would appear to be the more PvP focused class at this time, but we will have to see the meta play out. Of course, the Nightstalker Shadowshot super will be a very strong option for PvE players in Destiny 2. For more on Destiny 2, including guides on the rest of the subclasses, head over to our complete Destiny 2 guide.